Our first “by the numbers” post was about what countries this year’s accepted Google Summer of Code students are from - all 73 countries - which made for a big list. This time we’re serving up a mix of interesting stats in smaller charts. "How old are the students?" Google Summer of Code is for students ages 18 and older - but note the lack of an upper limit. While most of the students are relatively young, we also welcome non-traditional students to participate. This year our oldest student is 57. 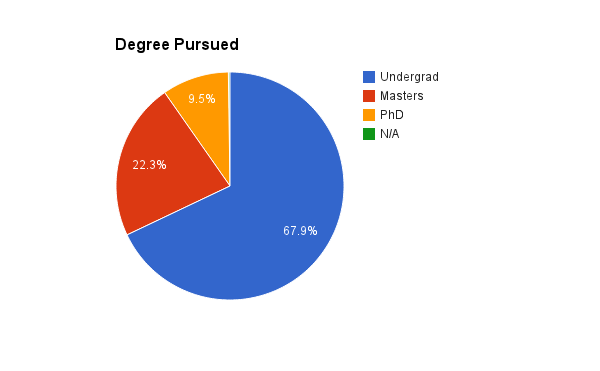 Year after year the majority of GSoC students, more than 50%, are undergraduates, but Master and PhD programs are well represented also. 2014 is no exception. "How many women are participating in GSoC 2014?" We are very pleased to report that just over 10% of this year’s accepted students are women. The percentage of female students has been increasing year over year since 2006, but this is the first time we’ve broken the 10% barrier. We are obviously still a very long way from gender parity, but we’re glad this number continues to trend upward. 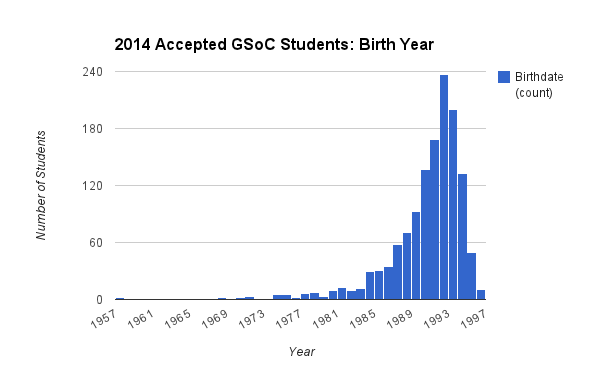 We will be doing additional posts about the statistics for GSoC 2014 in the next few weeks. If you have questions, please drop us a comment and we’ll do what we can to answer in an upcoming post.